Earlier this week, Nikon put the D750 on sale at US$1999.95 (or with the 24-120mm f/4 lens for US$2699.95). Curiously, the D750 filmmakers kit doesn’t get a discount (Update: a day after I wrote this, NikonUSA added a US$300 discount to the filmmakers kit). As if not to be left out, the multiple lens or 10-100mm lens bundles with the yet unreleased Nikon J5 (Nikon 1) camera went on discount, too. 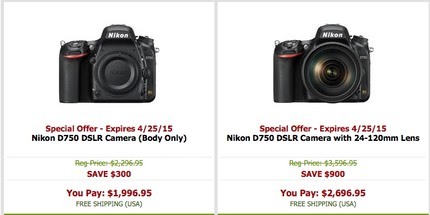 These are in addition to the older DSLR+lens bundle options carrying over (the lens-only rebates are gone). What we’re seeing is micromanagement at its most jittery. Nikon has more leeway to lower prices in the US due to recent yen devaluation against the dollar, but on the other hand corporate profits are under severe pressure as sales volumes continue their downward trend. Somewhere in Tokyo and Melville, there are multiple spreadsheets running constant evaluations of supply, demand, price, profit, yen/dollar value, and a host of other variables, while Nikon’s bean counters try to squeeze every last penny (or is it yen? ;~) out of every transaction. I don’t begrudge them that, but Nikon loyalists are already leery about buying anything given the series of QA issues Nikon seems to have teething new products. So demand is softening probably more than supply. Moreover, if you think that the Bank of Japan will keep up the aggressive monetary policies that drove the yen downwards against the dollar, you’d have to think that additional discounts are coming down the pike. This puts me in a tricky position in terms of advising this site’s readers. One of two things are going to happen in the foreseeable future: (1) Nikon will continue to lower some prices reactively to keep the factories running efficiently because demand is very weak and getting weaker; or (2) Nikon will eventually bite the bullet and realize that they have to become substantially smaller, and prices will actually go back up as they try to rebuild profitability at a smaller sales volume. It seems to me that Nikon is pursuing #1, but strongly resisting getting ahead of that curve. US$1999 for the D750 body is a very good price. It’s going to get a few more people to make the DX to FX transition, I think. But technically, there’s no reason why that price won’t eventually drop further. Witness the D610, which started at US$2299 and is now at US$1499, one of the largest price drops we’ve seen for a DSLR still in production ever. In some ways, the D610’s a better choice for those making the DX->FX transition, as that low price lets you contemplate replacing or adding a lens or two. You give up little in terms of image quality, though you do give up more in terms of features (including the swivel rear LCD of the D750). But as a solid, basic DSLR, the D610 suffices quite well. And we haven’t even seen the biggest deluge of gray market products yet, which will put even more pressure on prices when the built-up (mostly Asian) inventories need to be jettisoned by their holders to raise cash. The irony is that Nikon is going to end 2015 with the strongest DSLR lineup they’ve ever had. Totally solid from bottom to top, with at least one missing model showing up, too (hint, hint). Nikon has iterated the DSLR to basically as high a level as most people need it to go. Canon, too. And yet unit sales are still going to go down, and with that both companies will need to adjust something. Right now they’re tinkering (incessantly) with prices. That’s good news if you need a new camera, obviously. I guess where I’m headed with this is here: you can try to “guess the bottom,” but as with the stock market, you’ll probably miss. We’re in the trough, for sure. So when these discounts show up, seriously consider them. Don’t try to wait for the next round and hope they’ll be better. The fact that Nikon’s micromanaging them so much means that you may or may not get a better deal on what you want in the next iteration.